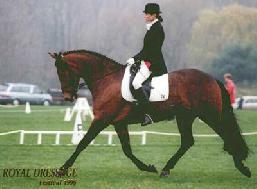 Bred in the UK, sold to the States as a yearling, and finally residing in Australia, Toddy was a well-travelled competition mare whose career began with American international eventer, Marcia Kulak, back in 1987. Toddy excelled in all disciplines, was twice regional dressage champion in the States while in training with Lendon Gray, as well as that rarest of jumpers - scopy, careful and brave all in one. Toddy came home with us when we returned to Australia, to embark on yet another career, as our foundation broodmare. She has four lovely foals to her credit to date: China Doll(Dolly) by Hannoverian stallion Diamond B Challenger; Conspiring(Spring) by Belcam's Cooperit(Imp); Vertigo (Clover), her first filly foal by Visage, and Vigil, our first solid-coloured Visage colt. Toddy's final foal, an embryo-transfer, was born in February 2008, a beautiful coloured filly we've called Venice.